where MAP stands for Mean Arterial Pressure, and CO stands for Cardiac Output. 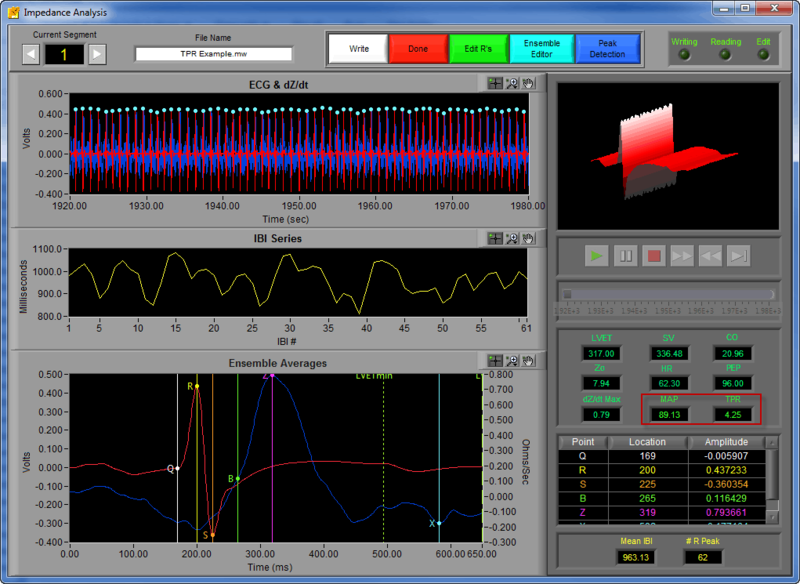 Cardiac Output is a value already calculated in the Impedance application. 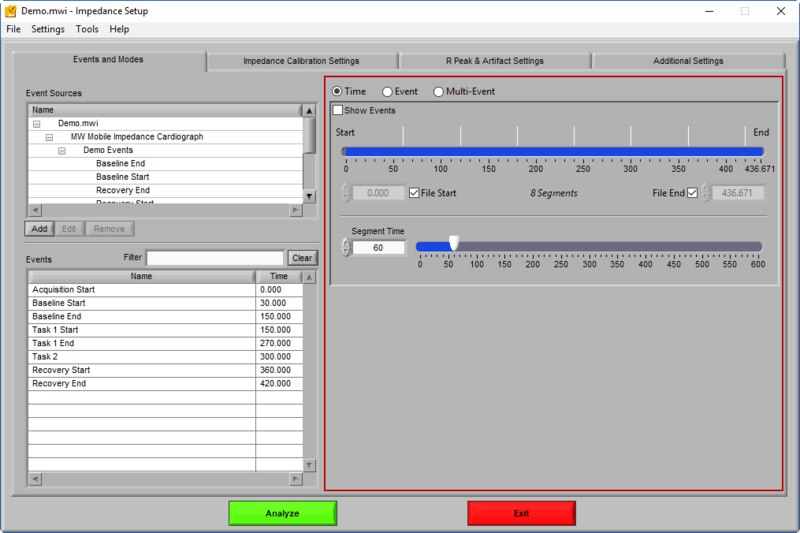 MAP, on the other hand, is a value calculated from the blood pressure waveform and therefore must be imported to the Impedance (IMP) application. 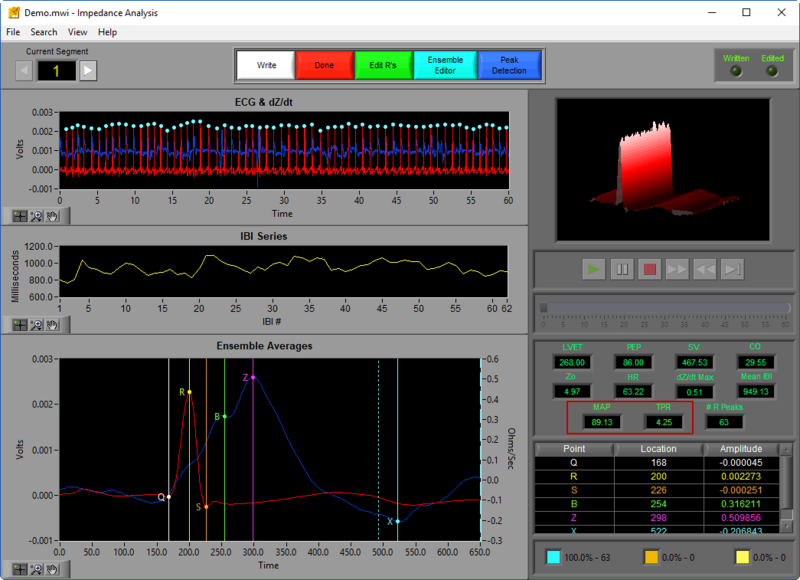 The easiest way to do this is by analyzing your blood pressure data in the Blood Pressure Variability (BPV) analysis application. First you must analyze your continuous blood pressure data in the BPV application and output the results to Excel using the same segmentation you intend to use when calculating TPR (i.e. if you want to calculate TPR based on certain events, you must analyze your blood pressure data based on those same events). Once the blood pressure data has been analyzed, open the same data file in the IMP application and ensure that your Events and Modes tab is set up properly. 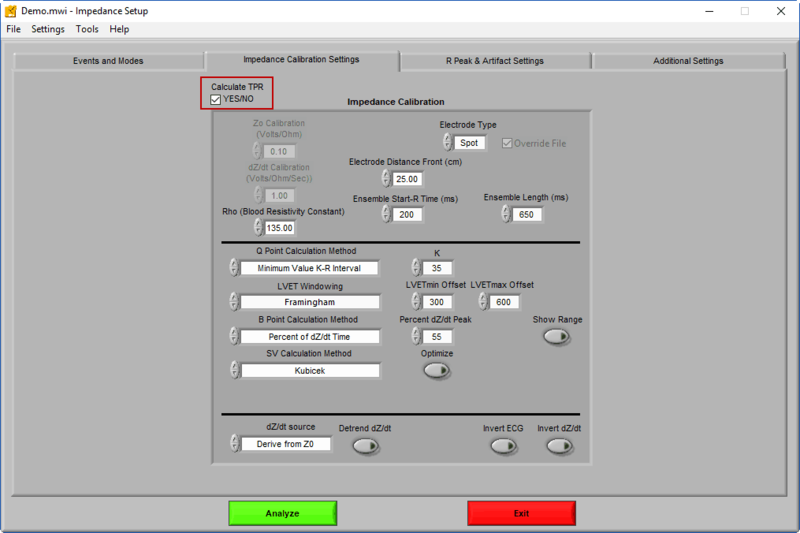 Next, proceed to the Impedance Calibration Settings tab and check the Calculate TPR check box. Press Analyze and you will be prompted to select a BPV output file for import. 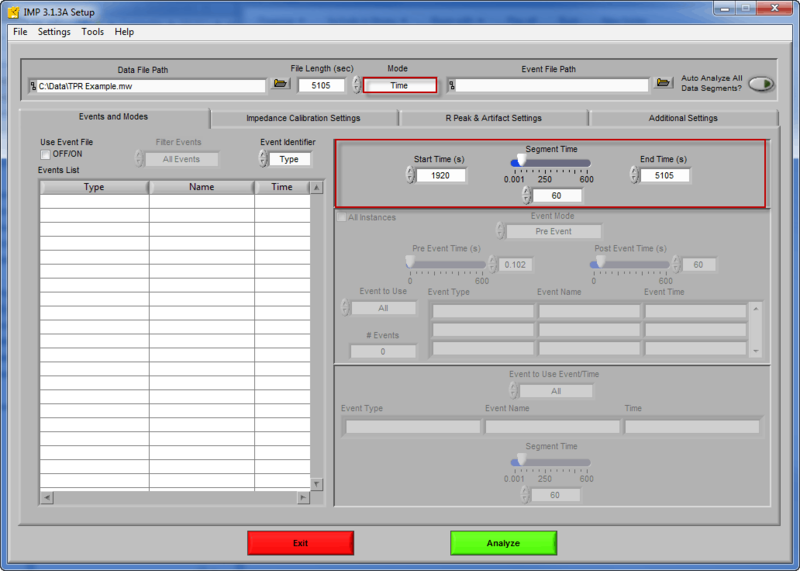 Select the file which corresponds to the data you are currently analyzing and press OK. 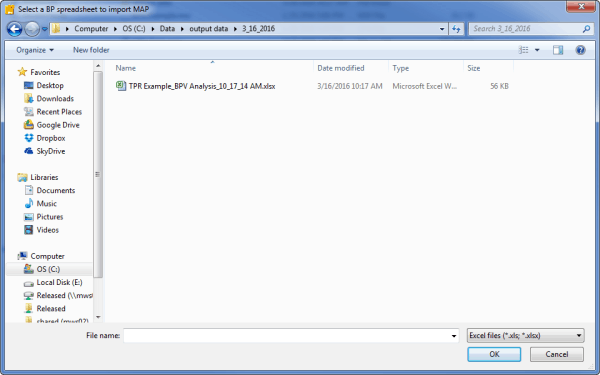 Note that if the application detects the segmentation in the BPV output file does not match the segmentation currently chosen in the IMP application, an error message will be shown and TPR will not be calculated. 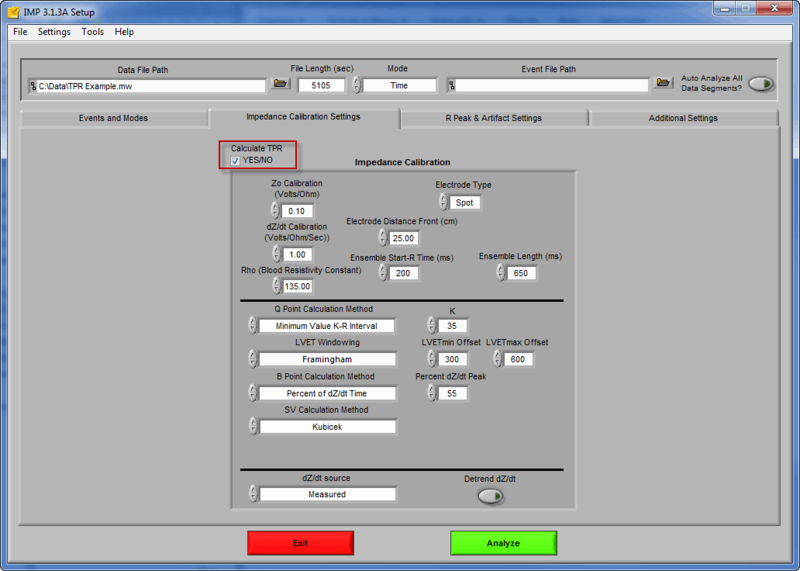 Additionally, if the Excel file is not a compatible BPV output file, you will receive a different error message and TPR will not be calculated. Once on the analysis screen, you will see the MAP value read from the BPV output file as well as the newly calculated TPR value displayed among the rest of the statistics. Editing the ECG series can affect CO, and therefore also affect TPR. When a segment has been sufficiently edited, press Write to store the statistics to the Excel output file.